Muskogee Lawyer BlogWhat are Muskogee, Oklahoma Annulment Requirements? A Muskogee, Oklahoma marriage can be ended by divorce, which is a dissolution of an existing contract between two people. It can also be annulled if the case fits Oklahoma annulment requirements. Unlike dissolution, an annulment treats the marriage as if it never existed. The marriage is either legally void or voidable. An annulment is tantamount to a legal declaration that the contract of marriage was never legally entered into. Age – one or both parties was under the legal age required for marriage. Mental capacity – one or both parties lacked the mental capacity to fully understand what he or she was doing and to consent. Fraud – either party was persuaded to marry under fraudulent circumstances. For example, a woman tells her boyfriend that she is pregnant with his child, and in reliance upon that statement, the boyfriend marries her only to find out later that she was not pregnant. In all of these instances, the person legally lacked the ability to consent and contract or that consent has been vitiated by the action of fraud. These marriages are voidable. 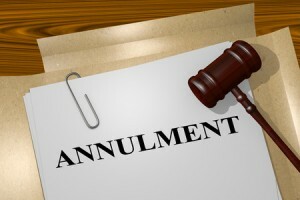 If a petition for annulment is brought under one of these grounds, and the issue of legal capacity has not yet been rectified, the court may grant an annulment. So if either party still is too young or lacks mental capacity, the court may grant the petition. However, if the age or mental capacity has been met, the court will not grant an annulment. Finally, a marriage that takes place before the expiration of required six-month “cooling off” period from the date either spouse was divorced is a voidable marriage under Oklahoma annulment requirements. An action to annul the marriage can be brought within the six-month period. There are instances where a marriage is legally void, such as when the parties are related and the marriage would be incestuous, or where one of the parties is already legally married, and the second marriage would be bigamous. In these cases, if an annulment is sought, the Muskogee court will grant it. These cases are highly technical, and generally require the assistance of a qualified Muskogee attorney. If you have questions about Oklahoma annulment requirements, contact an experienced Muskogee divorce lawyer as soon as possible to protect your legal rights.